Thisstory was updated at 5:03 p.m.
Theindependent blue-ribbon panel that reviewed NASA's plans to replace its spaceshuttles said Thursday that the agency should consider using commercialvehicles to help achieve its goal, and perhaps nix the new Ares I rocket slatedto fly future astronauts. In a155-page report entitled "Seeking a Human Spaceflight Program Worthy of aGreat Nation," the 10-member committee expanded on the fivepotential options it drew up over the summer for NASA's human spaceflightfuture, including more detail and data to be reviewed by President BarackObama. Committeechairman Norman Augustine, former CEO of Lockheed Martin, said NASA's plan toreplace the space shuttle fleet with capsule-based Orion spacecraft and Ares Irockets ? a prototype of which is poised tolaunch Oct. 27 ? suffers from a lack of funding so severe the agency maynow have the wrong vehicle for its mission. NASA'sstated vision for human spaceflight is to retire its space shuttle fleet around2010 and replace them with Orion spacecraft, to be launched on Ares I rocketsby around 2015 at the earliest. A larger Ares V rocket would launch heavy cargoand lunar landers into orbit to support new manned missions tothe moon by 2020. But after aseries of summer meetings, Augustine's committee found that NASA needs a budgetboost that would inject ultimately up to $3 billion by 2014 to fund NASA'splan. The stated five-year gap between the 2010 shuttle retirement and firstmanned Orion flights is likely to stretch to at least seven-years, with anyeffort to reach the moon or elsewhere likely to come in the early or mid-2020s,the committee found. Some of thefive basic options put forth by the committee include internal variants thatoffer a wider selection for President Obama to choose from. They include potentialtripsto nearby asteroids, trips that fly to ? but don?t land on ? the moon, and amission to explore moons of Mars. 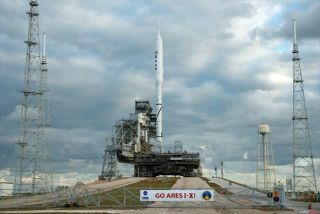 Several options do away with the Ares Irocket altogether. At theheart of the NASA's challenges has been funding, the committee said. In 2005, whenNASA tapped the Ares I rocket to launch Orion, it did so under budgetprojections that ultimately did not materialize. "Itwas right at the time, but times have changed," said committee memberEdward Crawley, an MIT professor. Crawleysaid there are no fundamental technical concerns facing the Ares I rocket thatNASA could not surmount given time and money. But the agency is slim on bothcommodities. It is spelled out starkly in the committee's final report. "Withtime and sufficient funds, NASA could develop, build and fly the Ares Isuccessfully," the report states. "The question is, should it?" Commercialspacecraft, spurred on by up to $5 billion in incentives from NASA, couldprovide the access to low-Earth orbit needed in the short-term after theshuttle fleet retires, and perhaps do so within the seven-year gap, thecommittee's report said. "As wemove from the complex, reusable shuttle back to a simpler, smaller capsule, itis appropriate to consider turning these transport services over to thecommercial sector," the committee wrote in its report. NASAalready plans to use commercial spacecraft to supply cargo to the InternationalSpace Station, but a push to use similar services to ferry astronauts to andfrom the orbiting lab should have new incentives and perhaps a new competition,the committee wrote. The finalreport also included more detail on the drawbacks of extending the spaceshuttle program beyond 2011, as well as extending the International SpaceStation's life through 2020. NASA will likely not be able to complete its sixthremaining mission to finish assembly of the space station until 2011, thecommittee said. Extendingthe shuttle program beyond that, and lengthening the service life of the spacestation ? which is currently slated to be deorbited in 2016 ? wouldrequire funding that could be used to build and fly new Ares and Orionspacecraft to orbit, the moon or elsewhere, the committee said. Despite thechallenges facing NASA and the future of the U.S. space program, the committeesaid the Obama administration has a chance to revitalize the American spaceprogram. "Theopportunity now exists to provide for the future human spaceflight programworthy of a great nation," the report stated.